I've been hearing a lot things about wakeboarding but I just can't find the perfect time to try it. From all the pictures that I've seen from my friends, it looks fun and challenging and seemed to be very-easy-to-do. Well, there's only thing to find out, TRY IT! One of my friends from college returned home and I told him that we should try wakeboarding while he's still here. Good thing, Deca Wakeboard Park is only few minutes away. Upon arriving at the park, there were several beginners just like us who were doing their best to at least move few meters away from the starting point. Oh my! I thought it's that easy but at the back of my mind, maybe they weren't following the basic positions being taught or maybe they were just too scared. Seeing them crashing several times almost convinced us to back out. However, there's this little voice at the back of my mind that I won't be able to find out if I can do it if won't give it a try. We spent some time getting there not for site seeing but to face the challenge ourselves. It took us 1 mango shake and a bowl of french fries before we finally leapt our feet to the registration area. Waivers has been signed and off we face the trainer for the briefing. 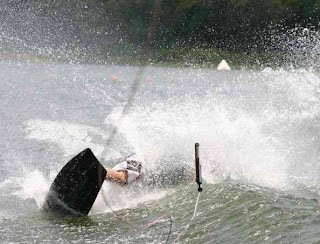 It' an SOP of the park to at least achieve two laps on the kneeboard before they would let us ride on the wakeboard. And this is it! With my heart having tachycardia, I knelt down and tighten my grip to the tow rope. "READY! ", shouted the cable control man who's also preparing himself for another set of good laugh. With the split of a second, the rope dragged me out to the water and amazingly I was able to achieve my balance! Wooooohooooo! I did it! But right at middle of my celebration, I suddenly don't know how get in between the first pair of orange buoy to keep my towing rope on the cables. The rope loosened and I let go. Good thing the life guard is nearby and assisted me to get back to the sides. Did I ever mention that I don't how to swim? It's been years that I've been relying on the existence of life jackets and floaters. However, it didn't stop me from trying water sports and adventures because I know these wonderful things exist to keep me floating. Because I don't know how to swim, it took me several minutes to get back to the sides. I did everything to get out from where I am because riders are also on their way and they might crash on my face. The life guard assured me that I shouldn't worry because they're already experienced riders and they know how to maneuver themselves to avoid me. However, my eyes widened upon seeing the speeding rider who is coming towards me, it's my friend and he ain't an experienced one! Oh my goodness! He almost hit us! Luckily he was able to control it and was able to get pass through us safely. What a relief! For a beginner to reach that far, that was already an achievement. It gave me enough confidence to try one more time. 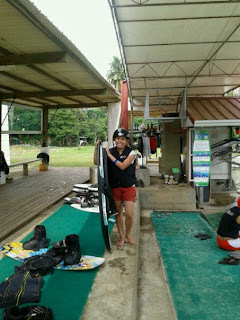 Proud and exhausted, I carried my board and walked back to the starting point. The trainer told me that in order to get inside the floating balls, I should pull the rope towards my left side and place all my weight to the right. He reiterated that moving the rope to the left side won't bring me anywhere. For the second time, I tried it. This time I was able to get inside the floating balls and completed the lap. However, the dragging force of the rope has been unbearable that I need to let go to have some rest. That ends my kneeboarding experience and everyone has been convincing me try the wakeboard. My friend tried several times but he kept on crashing. This time it's a lot more difficult. It requires strength and whole lot of balancing. However, it didn't stop me from trying but I end up crashing myself face down drinking a lot of water from the track. I Would definitely want to try one more time but arms were already sore. I guess that would end my wakeboarding experience. I would surely go back there and achieve it. wow! i bet you had a very great time with your wakeboarding experience! it made me want to try to it one day. It seems you have fun. I am afraid of waves that's why I admire your courage. I wanna try it, too. My friends tried kneeboarding in CamSur and they were able to have successful laps the first try so I chickened out. Too much pressure. LOL!